Juniper to the fore, supported by floral notes and spicy, warm cardamom with plenty of citrus ‘zing’ complemented by the gingery spiciness of coriander. Sweet, spicy, berries, coriander, citrus, cardamom, smoky, fruit, earthy. 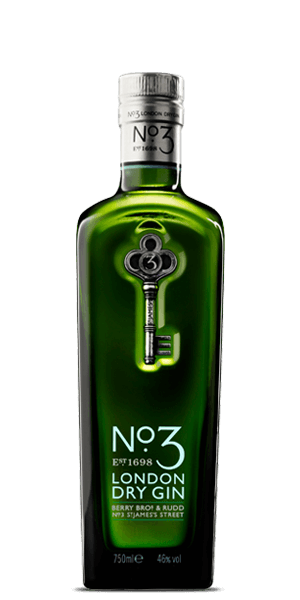 No.3 London Dry Gin is adored for its juniper, spicy, cardamom and coriander flavor notes. This Gin is carefully distilled at Berry Brothers And Rudd Bottler distillery, Netherlands. Based on 174 votes, the average rating for No.3 London Dry Gin is 7.8/10. — Very smooth and a great finish! — Very Clean. Welcoming Smell and delightful to the palate. Being able to enjoy all the flavors separately but together brings a warm smile to your face. I'm new to the tasting really but the finish has always been important to me and the No.3 is top notch on the back end. — I definitely get the citrus, light, and peppery notes of this. Very smooth, dry but not too dry. I could see this making a great G&T. Not London dry at all. Very floral. Good in G&T but not suitable for a martini, which is my fancy for a dry gin. Very Clean. Welcoming Smell and delightful to the palate. Being able to enjoy all the flavors separately but together brings a warm smile to your face. I'm new to the tasting really but the finish has always been important to me and the No.3 is top notch on the back end. Fresh scent greats you up front. Taste is smooth and uplifting. Starts sweet and fruity, and ends with a kick of spice with no harsh aftertaste. My favorite Gin. A most excellent Gin - strong but sweet and smooth. Well worth it. Very tasty with subtle botanical notes. Very pleasant. Makes a great G&T with Fever Tree Elderflower Tonic Water and lime. Very smooth and a great finish! smooth, subtle, amazing aroma with great tasting gin. sweet, almost similar to Sipsmith, with a hint of berry and spiciness without being dry. Smooth. Great flavor without being trendy. No one who likes gin could dislike this. I definitely get the citrus, light, and peppery notes of this. Very smooth, dry but not too dry. I could see this making a great G&T. Excellent, clean and honest gin without any strange flavors. Perfect with cucumber & Fevertree Mediterranean Tonic. Nice.... Very nice. Great addition to a bar for a night when a taste of gin is what you want.